Hello and welcome to the 70th episode of The Spark & The Art creativity podcast. Thank you for subscribing to our weekly podcast where we alternate between interviews with creative folks from all different career levels and insight and inspiration episodes. All with the intention you’ll get what you need to get your creative projects started and, more importantly, finished. I’m your host Tucker and this week is a chat with Creativity Coach and author of the marketing book for introverts called The Art Of Shouting Quietly. 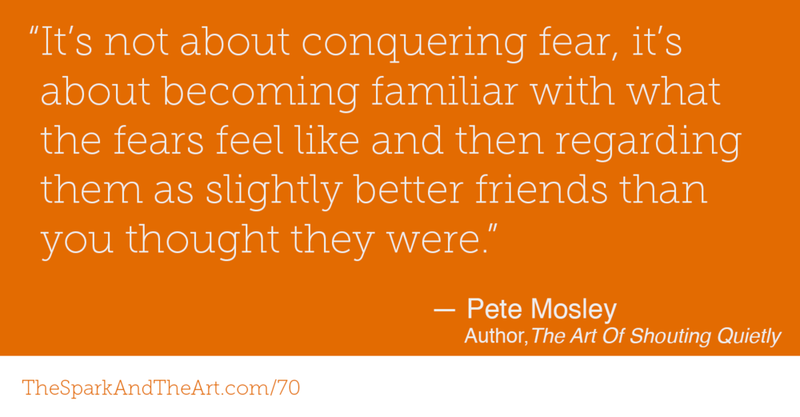 There is a lot of good stuff in here and I’m sure you’ll enjoy today’s chat with Pete Mosley. Do you feel like you are familiar with what your fear feels like? Does that feeling shut you down or can you use it to find your way into new territory? If you have a story of when you recognized your fear and moved forward with something anyway, I’d love to hear it. Leave a message on my toll-free number 1-877-966-4886 and I may use it in a future episode.